RevK®'s rants: No way to run the country! I am no expert on this, and to be honest, I seriously think they need to teach this in school a lot more. It matters, and affects us all. It seems there is a bill, the Counter Terrorism and Security bill. This goes through a process to make it a law. Like many bills, this goes through a load of stages, in this case starting in the commons with our elected officials considering it and proposing amendments. Several "readings" and a "committee" stage and a "report" stage and further reading. Then the bill goes through the Lords, again, several "readings" and a "committee" stage. But at this eighth stage in the process, after our elected representatives have had their say, and it has been considered twice by the house of Lords, we have an amendment. The problem is that this amendment actually contains 18 pages of stuff which is identical in almost all respects to another bill, the Communications Data Bill (aka The Snoopers' Charter). This is a bill that failed, quite conclusively for a lot of reasons. These were not just the cost to the taxpayer (£1.8 billion) which was probably a massive underestimate, but significant human rights issues. It is not even the first time this type of bill has failed. This is an attempt to "paperclip" this old, dead, and wrong, bill to the one going through, at the last minute. If it goes through it will not have had any of the normal stages of review by the commons (by those that we have elected) and very few of the stages of the Lords. 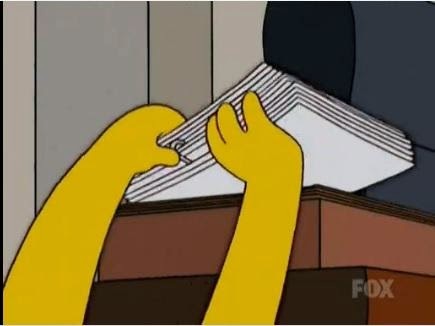 It is just like The Simpsons episode with something paper clipped to another bill. The people doing this should be ashamed, LORD KING OF BRIDGWATER, LORD BLAIR OF BOUGHTON, LORD WEST OF SPITHEAD, LORD CARLILE OF BERRIEW. It is shameful and you should apologise publicly for this. I hope this is quashed, and please - tweet a lord/lady in the house of Lords or write to your MP on this now. This is acting like Bart Simpson, paper clipping something to a bill at the last second to push it through, and you know it is wrong else you would not be so underhand with it. You should resign, and renounce your peerage and leave as a Lord, and leave now. This is deceit and underhand in so many ways and you are unfit to be making laws for us. The Open Right Group have more info [here]. This is no way to run the country and it will not be tolerated by real people. Message to MP sent. Facebook'ed and G+'ed. I agree this needs as much attention as possible. I share your anger over this. It's a stitch up. I too will be writing to my MP and to a lord and lady or two. The post below (which you may well have seen, coming as it does from fellow Open Rights Group supporter Paul Bernal) contains an excellent summary of the situation. IMO, his clear statement of the key issues will make the post a useful guide for crafting a letter to one's MP and any lords/ladies one plans to write to. When Thomas Jefferson said "The price of freedom is eternal vigilance" I bet he wasn't thinking that it's one's own government that needs to be watched. Message to my MP now sent. Emailed my MP, although he's a Tory so probably won't give a crap - this underhand abuse of the democratic process is an utter disgrace. eMailed my MP (Conservative, but with a history of standing against the Party Line occasionally). No reply yet.